Being CMO isn’t for everyone—the average length of stay for a CMO is 18 months, not a lot of time to prove your worth. 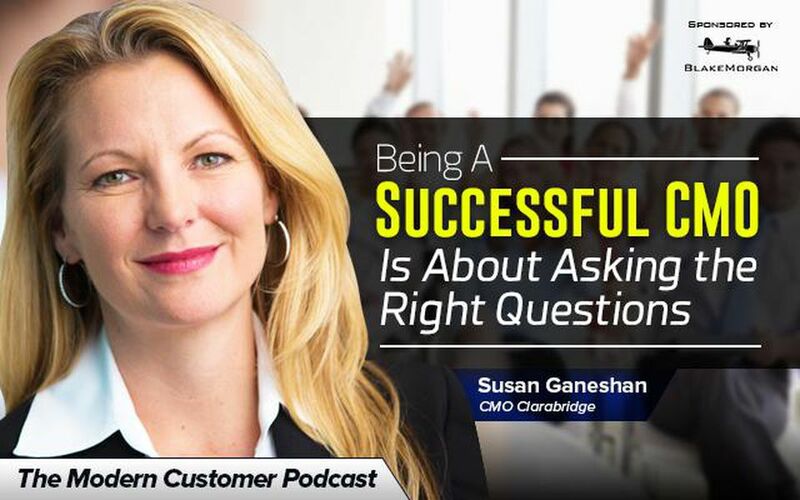 It’s important to turn results around fast and today’s podcast guest Susan Ganeshan knows how to do exactly that. Ganeshan has been CMO of text analytics and customer experience management vendor Clarabridge for two years and contributed to some of the major success they’ve had. Before that, she held senior roles at a few different software companies and while there, she mentored four different individuals who all eventually rose to the rank of CMO. It’s clear Ganeshan is focused on bringing results but also has a talent for mentoring and management. B2B marketing is not for the faint of heart. Translating technical products and services and turning that into engaging content is not the easiest. Being a marketer in today’s complicated digital environment takes courage, patience, and persistence. Ganeshan believes all tech marketers should be able to give a demo of any product their company is selling including the major components of the technology they’re supporting. Ganeshan believes that marketers fail when they can’t get the right metrics and measurements out of their campaigns. She has success to draw from and lessons learned, and in our podcast, we talk about some of the major top of mind issues facing modern marketers today. Disclosure: Clarabridge has been a client of Blake Morgan’s.